When you enter the park from Cherokee, NC (the east), the first spot you come to is Oconaluftee. There is a visitor center and the Mountain Farm Museum. The walk through the old farm buildings is interesting. The visitor center provides the history of the area and is well worth a visit. 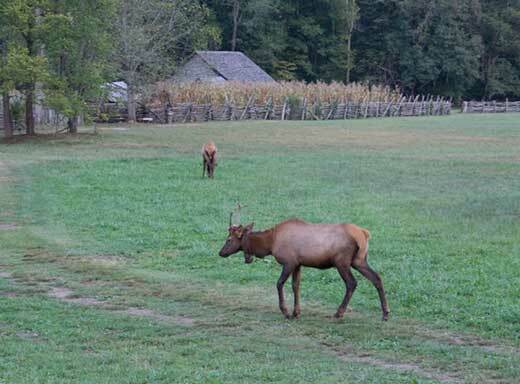 When we arrived at Oconaluftee late in the day, we noticed a group of young bull elk grazing in the field. We knew that elk had been reintroduced into the park, but thought that they were confined to the Cataloochee valley area of the park. The ranger told us that young elk often come over the mountain to Oconaluftee to get away from the old bull elk. The older elk don't tolerate the young folks during mating season--the old guys want the ladies all to themselves. And since the older bulls are bigger and stronger, they are able to keep the youngsters away. We had a long talk with the ranger and learned a lot about the elk and their management in the park. All the elk in the park are tagged and numbered. Travels with Nessie Home :: Site Map:: Contact webmaster@ncsparks.com-email us:: Copyright Leslie Sparks 2006, 2007, 2008, 2009, 2010, 2011, 2012,2013,2019:: Last modified: December 22 2013.